Produktion: Forma International, Milano, Centro di Documentazione Ebraica Contemporanea (CDEC), Milano. Buch: Marcello Pezzetti, Liliana Picciotto Fargion. Kamera: Sefi Baruch, Nicol• Bongiorno. Musik: Mario Piacentini. Ton: Roberto Serra. Schnitt: Daniele Orsini. Produzent: Elliot Malki. Uraufführung:19.2.1997, Internationales Forum des Jungen Films. Weltvertrieb: Forma International, Via E. Fermi 20, Assago, I-20090 Milano. Tel. : (39-2) 45706100. Fax: (39-2) 45703177. "I am trying to be strong. I see myself, once again naked, stripped of my dignity, my personality, of all that makes me human. I remember everything very well, I still feel the German rifle butts in my back." These are Elisa Springer's words in MEMORIA when she entered the 'sauna' of the concentration camp Auschwitz-Birkenau in November 1995. While witnesses of the Holocaust are dying out all over the world, there is an increase of historical revisionism which plays down the Nazis' Final Solution, even denying it. Elisa Springer is only one of ninety survivors of the Holocaust who have acted as witnesses for the 'Archivio della Memoria' (Archive of memory) on which the film MEMORIA draws. For forty years she remained silent about this tragedy. Now she has decided to talk in order to make disavowal impossible. 1943 to 1945: More than 8500 Jews from Italy and the island of Rhodos (then part of Italy) are deported to Auschwitz and other camps. About 800 Jews survive. 1946 to 1996: Fifty years after the Holocaust ninety of 800 survivors are still able to bear witness. For many years the foundation 'Centro di Documentazione Ebraica Contemporanea' (CDEC) has guaranteed scientifically based research on Jewish history in Italy, especially the Holocaust. Numerous research projects resulted in several authoritative publications: 'Il libro della memoria. Gli ebrei deportati dall'Italia (1943-1945)- The Book of Memory. Deported Jews from Italy, 1943-1945; (1991); 'Per ignota destinazione. Gli ebrei sotto il nazismo' - Destination Unknown. Jews under National Socialism (1994); 'Mussolini contre gli ebrei' - Mussolini against the Jews (1994). In 1993 the idea was born to establish a sound and film archive, which was to record and store the stories of survivors. The establishment of the 'Archivio della Memoria' was made possible first by private sponsors, the presidency of the advisory council of ministers, the Lombardy region and the ministry of education and cultural affairs. It was planned to make a film using the documents of the 'Archivio della Memoria', addressed to scientists as well as a broader audience, supported by a committee especially established to finance CDEC projects. Elliot Malki is president of this committee, Andrea Jarach and Giorgio Sacerdoti are vice presidents. The participants: there are ninety witnesses, still alive and available as well as capable of 'talking about the events'. Some have preferred to remain silent. Others such as Nedo Fiano, Liliana Segre, Goti Bauer and Settimia Spizzichino have been visiting Italian schools for years, talking to teenagers about their experiences. Their tales transport us directly into the tragedy, into daily life, i.e. death in Auschwitz. Some of them have survived medical experiments by Nazi doctors, others are the sole witnesses to brutal actions by the Sonderkommandos (special commands). These are human beings singled out by fate to live through one of the greatest tragedies of recent history. Faces, voices, experiences which we will preserve for the future, for future generations who will never know the living witnesses of the Holocaust. Filming on location meant returning to places of persecution in Italy: prisons where arrested Jews were kept, streets and houses where protagonists lived. The project is unique because protagonists talk in places where historical events took place, i.e. in the Jewish district in Rome, in Milan's prisons, Rome, Florence, Trieste, Genoa, camp Risiera di San Sabba, in the transit camp Fossoli, in Milan central station etc. Another unusual aspect is the fact that witnesses are not questioned by journalists or media specialists but by qualified historians who have done extensive research for the project and who have precise knowledge of the circumstances of each interviewee's life. Consequently, the interviewers and interviewees develop an especially cooperative relationship, a collaboration never before executed with such conscientiousness. "From this point of view one really experiences the camp once more, but the fear, the stress, the anxiety can neither be filmed nor described. It can't be described with words, not on screen and not in books." Settimia Spizzichino while entering the women's annihilation camp Auschwitz-Birkenau, Poland, November 1995. "Today I am blessed with ten grandchildren, and I now remember the scene when I saw a group of about two hundred little girls who were holding their rag dolls in their arms as they marched into the ovens. The fire in the ovens burned for longer than two days." Romeo Salmoni on the ramp of Auschwitz-Birkenau, Poland, November 1995. "You don't return to Auschwitz to keep things to yourself as if they were private property. You return to Auschwitz because you want to share the experience with other people...We can't manage, however, to be truly thankful for regained freedom." 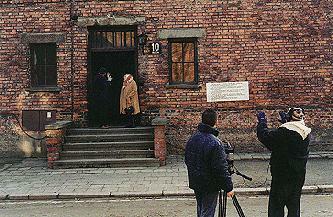 Cameraman Nicol• Bongiorno reports: "We went twice to Auschwitz, once in the winter, once in the spring. Some came on their own, in most cases, however, children wanted to come along. We realized that survivors were still racked by boundless pain and that the pain had infected their children. Our research showed that concentration camp survivors seldom committed suicide but that many of their children did." (...) The initiative of 'Centro di Documentazione Ebraica' is not the only one of its kind. There are many efforts throughout the world to document the reports of survivors of the Holocaust before it is too late, a.o. the Spielberg Foundation, Yale University and the Washington 'Holocaust Memorial Council'; there are further institutions in France and Belgium. We hope that MEMORIA is seen not only by those who have always fought against Nazism and racial persecution, but also those who have never heard about it before - or didn't want to hear about it. Ruggero Gabbai was born in 1964 in Antwerp, Belgium and grew up in Milan, Italy. He graduated from Columbia University in New York with an M.F.A. in film/ directing. He made the documentary The King of Crown Heights about Rebbe Lubavitch and was student and assistant of directors such as Milos Forman, Emir Kusturica, Paul Morrisey and Paul Schrader.